To use this app you must have a Rently Keyless hub setup. If you want to get a hub, please call 1-855-248-8144 or mail support@rentlykeyless.com . After you get the hub, use your Android or iOS device to download the Rently Keyless App and register with us. Once you set up your hub, you can use devices such as Switches,Thermostats and Dimmers. 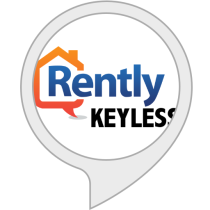 1) Open the Alexa app and go to Link with 'Rently Keyless Smart Home' skill and login to your Rently account. 2) Say Alexa, discover devices. Your devices will be displayed under Smart Home in the Alexa App. 1) To update the names of the devices, use the Rently Keyless smartphone App and update the device name to what you would like to call them. 2) Always discover your device to get the changes in device name. 3) Please make sure your hub is online before you try to discover devices using this app.